HAVANA - Cuba is going to adjust its constitution. The current constitution of the communist country dates from 1976 when the Cold War was still in full swing. A number of modernizations will be implemented, but a drastic break with the past is not expected. 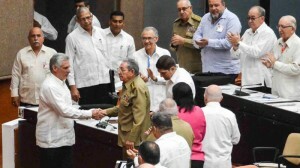 The committee that will write the new constitution is chaired by 86-year-old Raúl Castro, who resigned as president in April. The committee has 33 people, including the new president Díaz-Canel. The authorities have already hinted that the power of the Communist Party will remain anchored in the constitution. Freedom of the press, freedom of expression and other rights are, according to government officials, restricted "for the sake of socialist society". One of the modernizations is likely to be an age limit and a maximum of two five-year terms for the president. Furthermore, a number of economic reforms are expected to be recorded. This concerns, for example, the recognition of private property and the authorization of foreign investments, developments that have been going on in Cuba for years. Also, gay marriage may be included in the constitution. Raúl Castro's daughter Mariela has campaigned for this. Once the draft text of the constitution is ready, the parliament will consider it. Then the new constitution is presented to the Cuban people in a referendum.